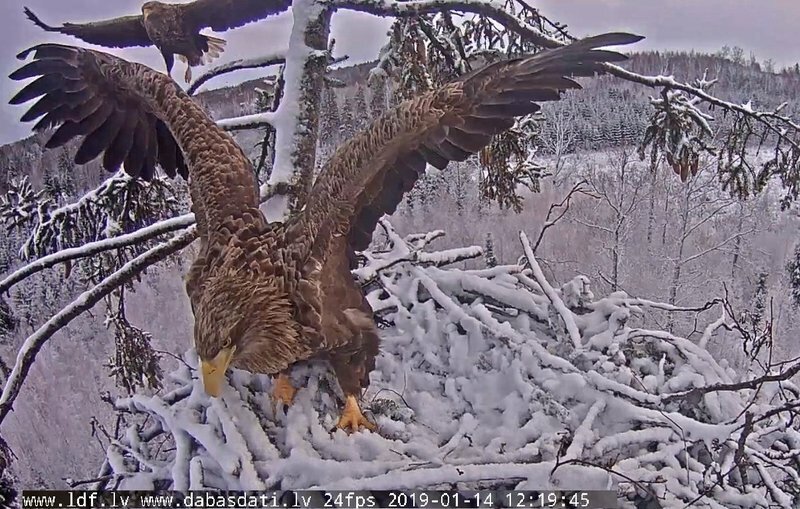 12:19 Milda came down from the branch to the nest when she saw that Raimis was coming. i think he was followed by some ravens. they started nest work together. 12:23 some eagle kisses. then Raimis went to the left branch. 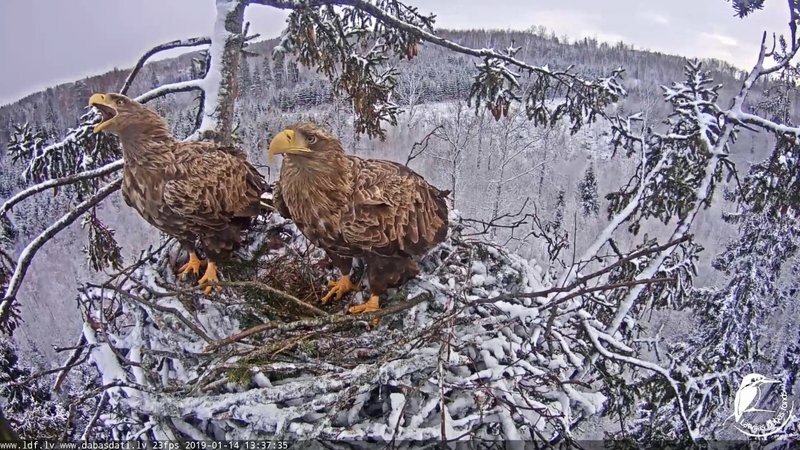 Milda stayed on the nest shoveling snow. after the kissed it seemed to me that Milda was looking by Raimis at something in the forest. perhaps the raves were there. 12:35 Raimis called on his branch. apparently he saw something in the sky but i can't see what it was. he raised his head feathers... then he called. 12:41 Raimis saw that Milda was coming and he flew away. Milda landed with a stick. At 12:20 the big bird at the left in top flew by. I did not understand who. i think that the bird was a raven. they followed Raimis when he came. i heard a lot of their voices. 12:55 Milda brought a stick. 13:00 Milda flew by from the left towards the meadow. she returned to the left. 13:01 she brought a stick. Raimis worked... Milda was looking around. 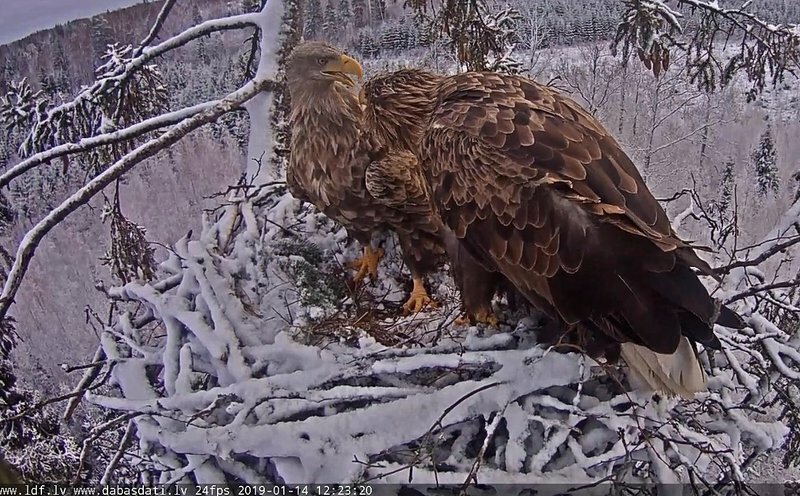 13:02 Raimis rubbed his bottom against the nest. 13:03 Raimis went to his outer left branch. the above picture with two tails! 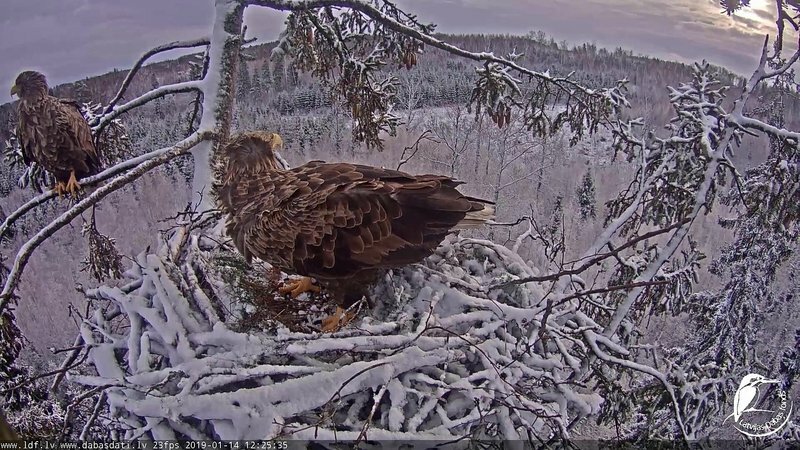 13:08 again Raimis flew away when he saw that Milda was coming. she had a long complicated twig, almost like a whip. Raimis was clever to fly away. 13:11 Milda went to the top branch. 13:13 she turned around and then flew away. 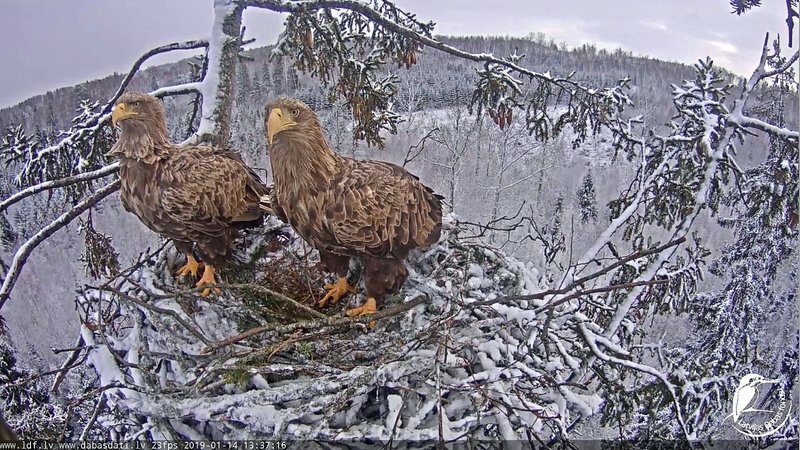 13:20:52 the eagle flew away. 13:24 Raimis came with a stick. he landed on the left branch first before coming to the nest. 13:26 RAimis worked hard. there were many new complicated sticks. 13:30 Milda flew away. Raimis worked hard. 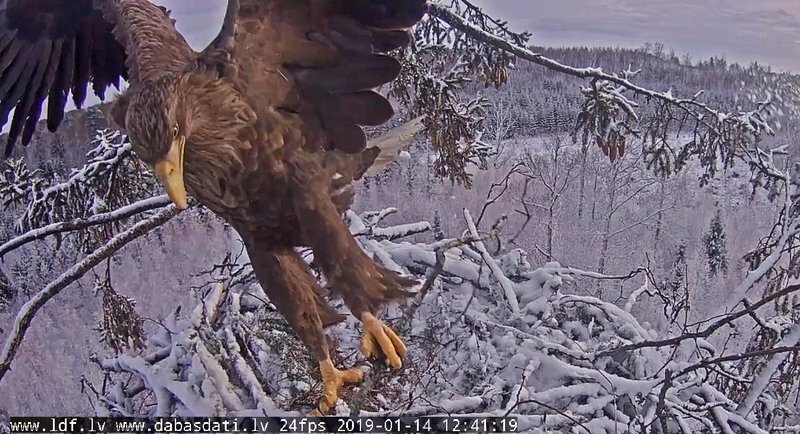 13:36:about 20 Milda flew by from left to the meadow. there she turned back and landed with a stick. 13:37 they saw something.... and Raimis called. 13:38 the "something" interesting was still in the sky. Milda and Raimis stared in the sky for a long time. 13:40 the "something" was gone and they started to work again. 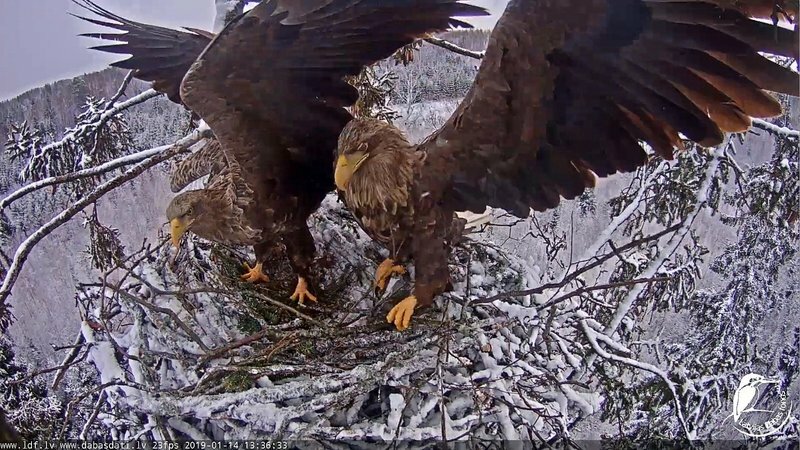 13:42 Raimis went to the left branch. 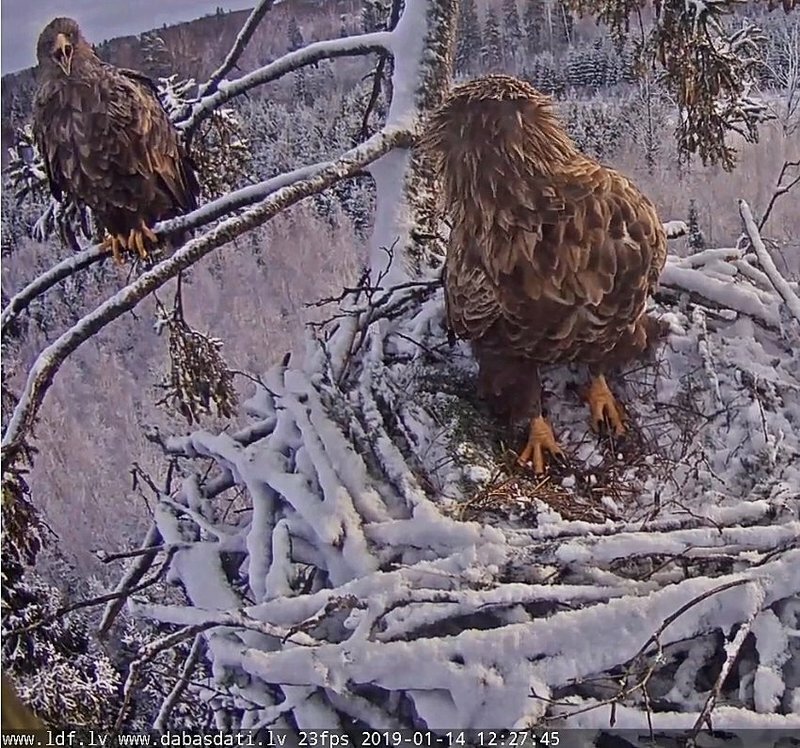 Milda was lying on the nest.